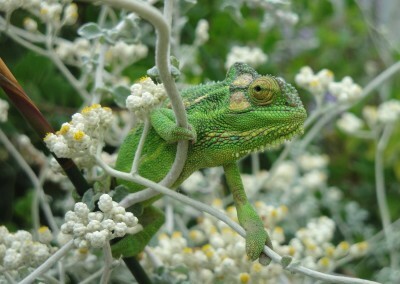 Unlike the remarkable diversity and density of plant species, the same cannot be said for animals in the Cape Mountains. The nutrient deficient soils, extreme climate, lack of grasses and permanent water all militate against a high carrying capacity of animals although of course it’s true that there were many more animals before the arrival of the European settlers from the 17th century and the rise of agriculture and urbanisation. 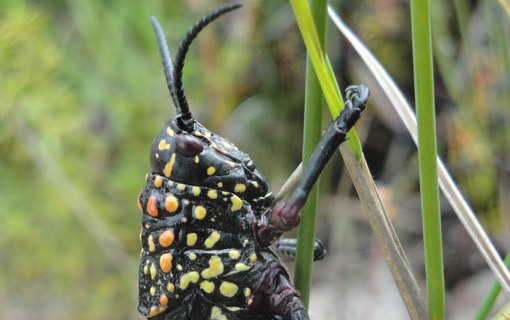 Vital as pollinators and a food source for birds, insects in the Cape Mountains are not as abundant as in other South African biomes but it also happily means the Cape Mountains are mostly free of biting and stinging insects. 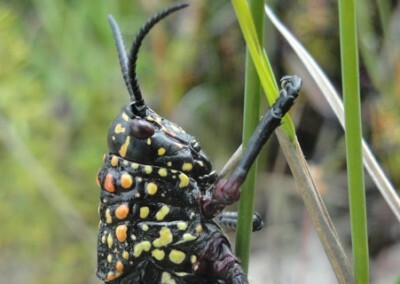 This is not to say of course that there are no insects: it is not known exactly how many insect species there are in the Cape Mountains but there are at least 3 000 beetles in the Table Mountain National Park alone and a keen observer will find insects crowded in flowers, spider-hunting wasps dragging their paralysed prey into their lairs, ant-lion larvae waiting in sand traps and golden orb spiders sitting at the centre of huge webs. Frogs and toads are found in the many water courses of the Cape Mountains. 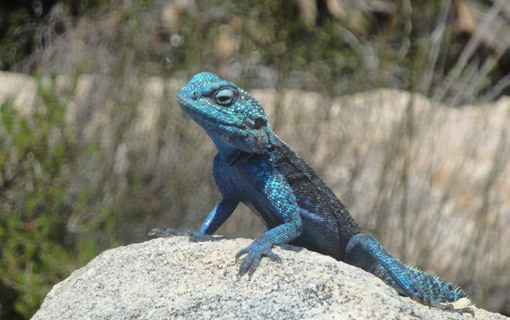 Some 17 species have been recorded in the TMNP ranging from the commonly seen Cape River Frog to the enormous Western Leopard Toad while the ever-elusive Table Mountain Ghost Frog survives in only a handful of streams on Table Mountain. 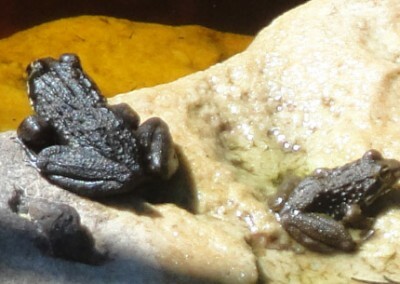 Even more bizarre are the Rain Frogs – the Cape Rain Frog and the Mountain Rain Frog don’t swim (in fact if you put them in water they will blow themselves up with air and drift to land) and lay their eggs in damp soil, the young emerging as fully-formed frogs. 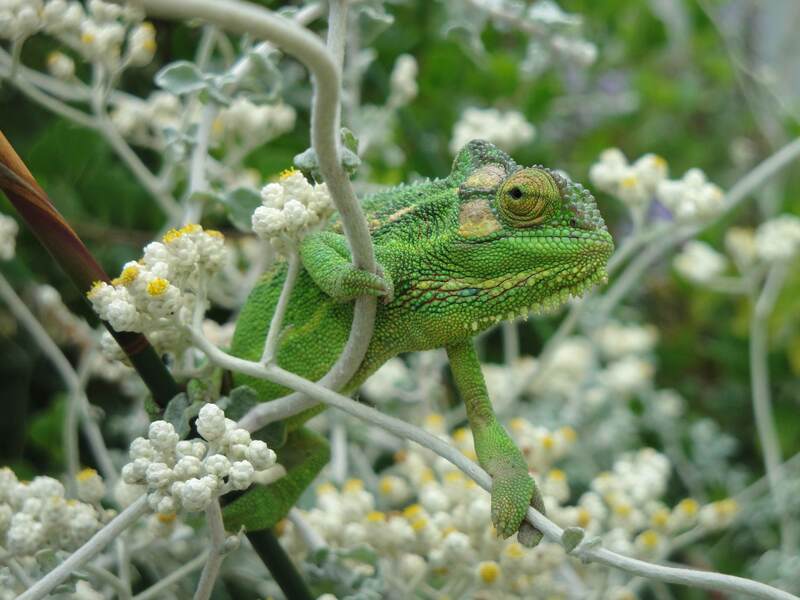 Sun-loving reptiles are some of the most common animals you’ll see in the Cape Mountains. 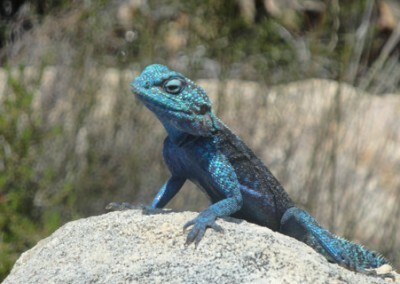 Lizards such as the Southern Rock Agama (watch for the displaying males’ blue-green head), the smooth Cape Skink and the Black Girdled Lizard (the ‘Cape Crocodile’) are commonly seen basking on sunny rocks. Tortoises are well represented but as South Africa has the richest diversity of tortoises in the world it’s not surprising. 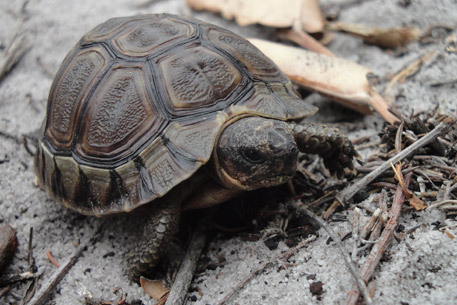 In spring and summer the Angulate Tortoise, Common Padloper and Parrot-beaked Tortoise are often seen, while wetlands and streams are home to Marsh Terrapins. Snakes are well represented too. Remember that the chances of seeing a snake are very slim; the chances of being bitten by one slimmer, and the chances of being bitten by a dangerously poisonous snake very remote indeed. Of the 22 snake species recorded in the TMNP, 10 are non-venomous, 7 mildly venomous and 5 highly venomous. Mostly seen in summer, the usual snake sighting is that of its tail disappearing into thick cover. There are very few birds in pure fynbos but there are 6 endemics, a fact that attracts many bird watchers to an otherwise poor birding environment. The ‘Fynbos 6’ are: Cape Sugarbird; Orange-breasted Sunbird; Cape Siskin; Protea Seedeater; Cape Rock-jumper and Victorin’s Warbler. 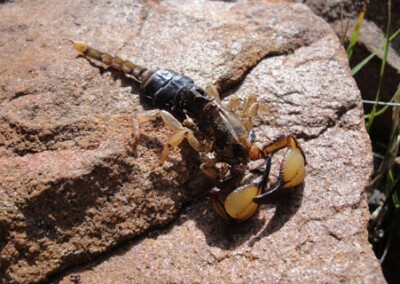 The latter 3 are not found on the Cape Peninsula though the first 2 are quite common in the TMNP. Other fynbos birds include Red-winged Starlings; Ground Woodpeckers; Cape and Sentinel Rock-thrush; Cape Grassbird; Neddicky; Karoo Prinia; Pied Crow and White-necked Raven. Raptors are well represented with 12 breeding species in the TMNP and a further 12 recorded as migrants and vagrants. The most common birds of prey are the Rock Kestrel, Peregrine Falcon, Rufous-chested Sparrowhawk; African Goshawk and Black Sparrowhawk while the Jackal Buzzard and Black Eagle are commonly seen in the Cape Mountains as well. Note that coastal areas contains more birds than fynbos – especially insectivores and generalists such as shrikes, bulbuls, fly-catchers, canaries, white-eyes, mousebirds and sunbirds. On a similar note, the Afromontane forest is good for the Cape Batis, Cape Robin, Olive Thrush and Olive Pigeon and Cape Point for Ostriches. Late winter and spring sees many proteas and ericas flowering and is a good time for birding in the mountains – look out for Cape Sugarbirds and Orange-breasted Sunbirds displaying and feeding. 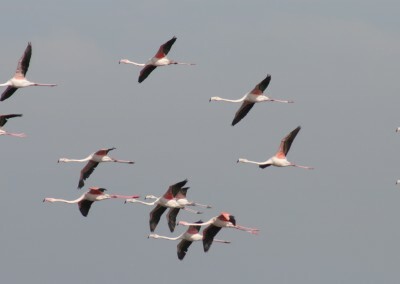 Coastal wetlands such as Langabaan and the Strandfontein sewerage works see large numbers of Palaearctic migrants (mostly waders) in summer while the Afro-montane forest biome attracts migrants such as Paradise Flycatcher and Red-chested Cuckoo. Marine birds – gulls, terns, waders, cormorants and gannets – can be seen anywhere on the coast and at any time of year; pelagic birds – albatrosses, shearwaters, skuas, petrels – can sometimes be seen from cliff tops in spring and autumn. It may sound incongruous to talk about mountains and marine birds but the Cape Mountains often extend to the ocean’s edge – at Cape Point for example. 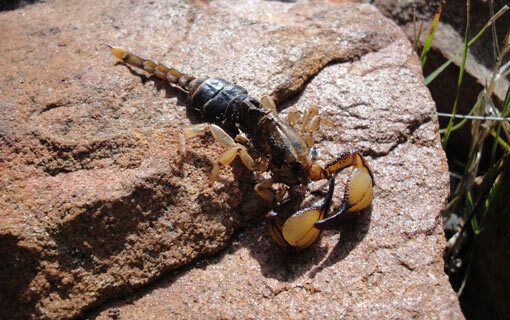 The Cape Mountains have never really supported large numbers of mammals given its low carrying capacity. The big mammals – blue antelope, quagga, eland, red hartebeest were nearly all found on the low-lying, grassy renosterveld along with their main predators: lion, wild dog, black-backed jackal and spotted hyena. Lions however were gone by the 1720s; the last Cape Peninsula leopard was shot in the 19th century. The most common mammals seen in the Cape Mountains are small antelope (klipspringer, Cape grysbok, common duiker, grey rhebok); baboons; rodents, ranging from the porcupine to the striped mouse and dassies. 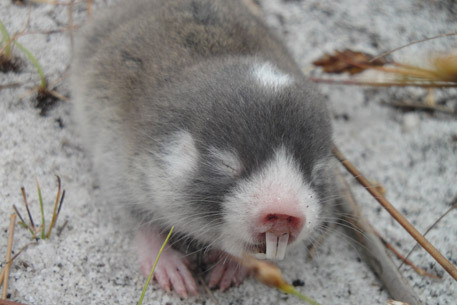 Evidence of both the Golden mole and the Cape dune mole rat can often be seen in sandy soil. The leopard still tops the food chain and occurs surprisingly close to Cape Town. There are leopards in the Kogelberg, Groenlandberg and Hottentots-Holland mountains though note that they are far smaller than the leopards of Kruger due to a restricted diet. Other predators include caracal, Cape clawless otter, large and small spotted genet, various mongoose species and the Cape fox. Many of these small mammals are nocturnal and/or secretive and spotting them is usually all about luck. Cape Point remains the best place to see large mammals such as eland, bontebok and mountain zebra.